Modern art is not as easy as realistic art to understand; it takes a little bit of effort. The sense of elitism in the art world is intimidating, compounded by upper class twits that might look down on us. It’s expensive to own real artwork, so why would spend a lot of time looking at something you couldn’t own? Looking at picture after picture after picture after picture seems boring. Art museums are not overly child-friendly. All these are valid, but in my mind, silly concerns—some of which I may be able to help you with this handy guide to surviving (and enjoying) modern art museums! Try to print out a copy of the museum map, noting the art movements and artists you are particularly interested in and their locations in the museum. It’s also a good idea to make note of museum hours and current prices (this is very important for some of the traveling exhibits, which can be very expensive). Give yourself enough time to enjoy the experience—being rushed is not what a museum visit should be about. Bring a small drawing pad or notebook, a pencil, and a pencil sharpener. Do not bring pens! (Many museums will not let you bring in a pen, so you might as well just leave it at home.) I bring a sketch pad with me because I am always inspired by some unique artistic principle or element that I particularly enjoy, and can perhaps incorporate into my own style/technique/skill. At times, I simply note down an artist’s name for later study. The most important aspect of bringing a notepad to an Art Museum is that—for me—it turbocharges my imagination and creativity. I do more sketches/writing during and immediately after an Art Museum visit then during a whole month without. See what it can do for your creativity, too! Pace yourself. It’s OK to take breaks while viewing art! Every artist knows that NOT everyone will like every single piece of art they create, and that everyone brings their own feelings, thoughts, ideas, and moods with them when they view any particular piece of art. (We call it “emotional baggage”.) Just like when meeting new people, you will like some art right away, while some will grow on you. Some you just won’t “get”, and some you will absolutely hate. That’s okay. Let me say this again: that’s okay. You don’t have to love every single piece of Art in a museum—it’s absolutely normal not to. Once you arrive at the galleries you are interested in, don’t look at every single piece intensely—that road leads to madness! Instead, slowly walk through the gallery, casually looking at the art as you stroll until you come upon a piece of art that MAKES you stop. Stop, look at that piece of Art, take your time, find a bench and sit down in front of it, and ask yourself some questions. Why did you stop? Be specific; try to figure it out. Look beyond the simple surface information of the piece because all artwork has layers and layers of communication. Perhaps you will find that what you thought was a simple image turns out to be quite complex, and that complexity called to you, making you stop! How does the art make you feel? Not all art is “happy art”, but even works that are dark and disturbing communicate something to us. What does this artwork actually mean? Is it straightforward? Is there subtle meaning? Is it totally whacked? This is usually one of the harder aspects of Modern Art to deal with because most artists expect you to be an “active viewer”. Your thoughts and ideas are inherently part of the meaning of the piece—what you think matters. You will find that quite a number of modern artists will leave their pieces either untitled, or with a title obscure enough that it doesn’t do much to tell you the exact meaning of the piece. Would you own this piece of Art? Don’t think about price, rarity or value. Would you put that piece of art on your wall? If the answer is yes, make sure to stop at the museum gift shop to pick up a poster or postcard so your enjoyment doesn’t have to stop when you leave the museum. Visual and Auditory Art go together! Try bringing your own soundtrack with you. I used to bring multiple cassette tapes with my Walkman whenever I would visit a museum, carefully choosing the music dependent on what exhibits I was interested in perusing. Now my Walkman has been replaced by an iPhone and iPod filled with custom playlists for any exhibit or mood. Hudson Valley School of Painters? Perhaps some songs from Paul Winters’ Canyon. An exhibit by Paul Klee? Miles Davis’ Sketches of Spain should fit the bill. 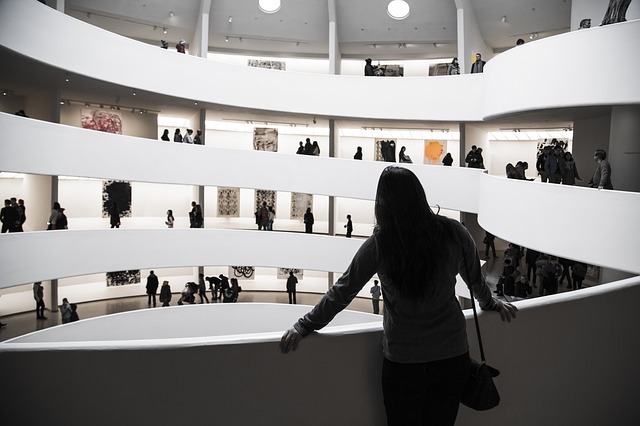 Music can truly enhance your enjoyment of a Modern Art Museum, with the added benefit of muffling those environmental ambient sounds that can impinge on your serenity. You may also experience some “Eureka!” moments where your music perfectly enhances a piece of art! That is when you’ll grab your friend, drag them over to that piece of art, and make them listen to that song while they look at the Art too, and talk to them about it later! 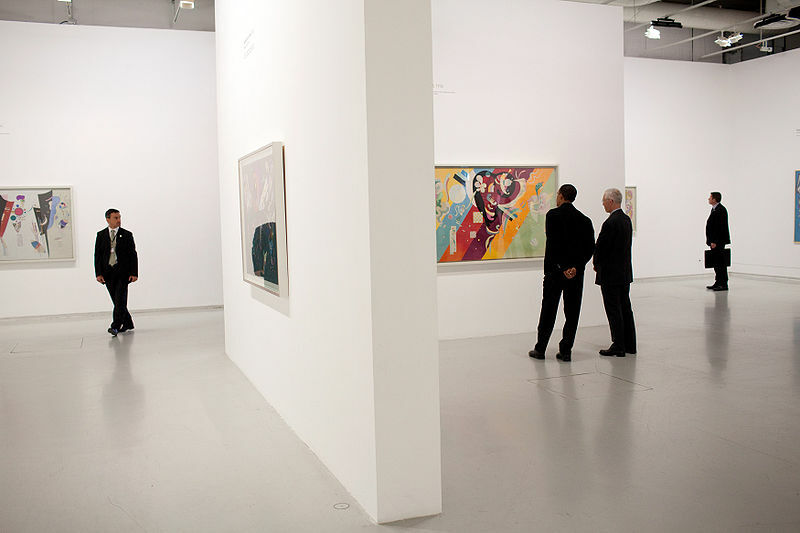 Guided tours are fine if you want to know some dry history of an artist, or movement they are associated with, but expect to be jostled, crowded, unable to see the artwork they are talking about, and hurried through the exhibit. Does knowing that Vincent van Gogh was influenced by the Hague School of painting give you more or less enjoyment of his The Potato Eaters? Probably not. Don’t be rushed into trying to see everything. Take a break from looking at the art every once in a while to have a cup of coffee and a cookie in the café or see if the museum shop has a poster or postcard of that piece that you like. Go outside for a few minutes. Don’t feel forced or pressured to look at Art—that’s the surest way to destroy any enjoyment. So, that’s about it—some hopeful and helpful hints on visiting an art museum from an artist and art geek (not an art historian). I have just two more points to add. 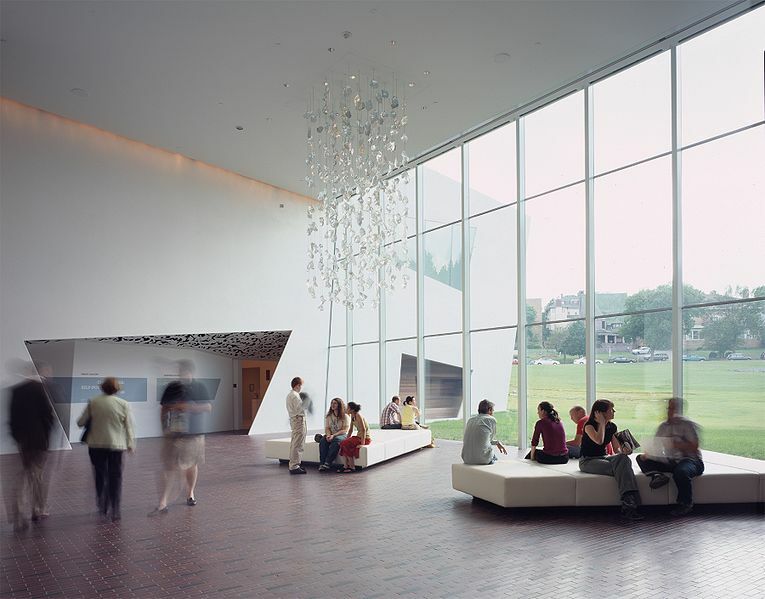 If you have children that you would like to bring to an art museum, check with the museum for children’s programming and activities, or check online for activities that you can download, create and/or participate in with them while you are visiting the museum. Jeffrey McNair is an artist, world traveler, writer and professor in media arts. He holds a B.F.A. and M.A. in Fine Arts (Which would make him the most educated burger-flipper if he wasn’t an instructor.) He has exhibited both here in the United States and abroad.